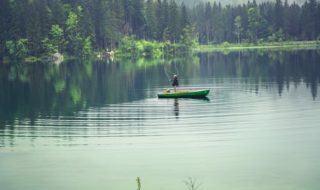 In a recent match I lost a fish that I simply couldn’t do anything with and quite frankly made me feel a little inadequate. The lads around me were trying to tell me that it was a carp, but having never caught a carp out of the river I just couldn’t tell. 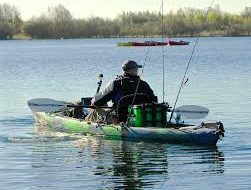 The worst thing about it was that I was fishing for barbel at the time and felt that i had the gear on to handle pretty much anything. That fish broke me on 0.21mm Powerline when it wasn’t even moving! Since then I have been wracking my brain about that fish and decided that I would go and try to catch one. I know that in recent years they have a proper feed around this time of year and one of my best mates Dean Smith and his brother in law had six in a session from the peg that I was intending to fish this time last year, at North Clifton. I fished two rods, both 14’ Shimano Catanas with a 3oz carbon tip. Both rods were matches with a 5000 Shimano Technium reel with 8lb Technium mainline with a 1oz medium Nisa feeder and a 2oz lead. One rod was to be be chucked downstream with either boilie or big halibut pllets on it and the other would be fished with maggot and caster hook baits cast close to the far bank in front of me at 60 turns. On both set-ups I started with a 2/5ft 0.21mm hooklength and a size 12 PR39 hook. Groundbait choice was 1kg of Dynamite Baits Silver X Carp in match green, with Ringers Bag Up and Dynamite XL Brown Crumb mixed in equal parts. For the rod cast in front of me I was “sandwiching” chopped worms, casters, maggots and 3mm Dynamite halibut pellets. The other rod was getting 8mm and 3mm halibuts through it. The session started slowly and it took about an hour to get my first bite, which was a very aggressive 6lb barbel. Next drop in I got one of 8lb and the following cast a barbel did me in a snag. About 20 minutes later and the biggest one of the day of 10lb was netted. Things went quiet for some time and then, out of the blue, I had another barbel 6lb just before the tide changed and started to fill up. The fill up was very slow and only held the flow, which from experience isn’t usually a good thing and sure enough, whilst it did this there wasn’t a single indication. About 30 minutes before the tide was due to top, the pace began to pick up and as soon as this happened I had a very positive bite and felt another barbel shortly before it had me fast and broke me. Next cast and the 1st of four good bream came to the net, the biggest being 7lb. As with the barbel these bream all came in a very quick spell as the tide was topping out. Once the tide had topped and the river was picking up pace to run off it went a little quiet for a time, which was strange as this is usually a very good time for bites. But as soon as the pace really started to go I got a slight indication and then a drop back. I picked the rod up and felt a very substantial fish on and it proceeded to strip line off my real at a severe rate! I was now involved in the same sort of fight that I had the other week, as this fish just continued to take line and disappear downstream. After about a minute of nothing but back winding I decided to try and hold onto the fish and at that point everything just gave way….. gutted! I had hooked another one of these fish and lost it, only this time it hadn’t broken me but the hook had pulled. I quickly had another cast and immediately had a savage bite. I could tell this was a big fish but it just bumped all the way in like a bream. I was thinking that I might be into a huge double figure bream until it started to rise and a saw a huge tale break the surface and then it woke up. It didn’t take long to get in and I was overjoyed with my first river carp that weighed 14lb 8oz. Brilliant! The only thing that was bothering me was that it didn’t fight like the fish I had been losing, so what could they be? I decided to have another 20 minutes and just as I was about to pack up another very aggressive bite. Here we go again! The fish just charged off downstream and then kited into the margins. 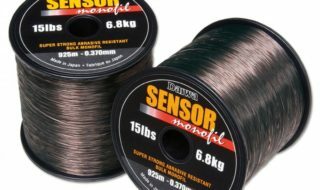 I had to wade out downstream as when fishing on peg 22 at North Clifton on the River Trent, there is a barbed wire fence that is below you and goes about 10 yards out into the water. I began to get some line on this fish and started to feel like I was getting somewhere with it. After 10 minutes of frantic action a beautiful 13lb 10oz common surfaced and was safely netted. This fish didn’t look like it had ever seen a hook and the fight never stopped even when it was in the net. All the barbel fell to three casters and the bream and carp were all caught on three red maggots. Interesting because I never had a bite on the boilie or pellet rod, which really surprised me given the size of fish I was catching. This has got to have been the best day’s pleasure fishing I have ever had – a real red letter day!!! 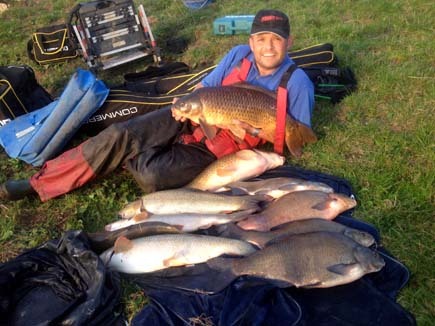 Alan Henry with the results of the best day’s pleasure fishing of his life on the River Trent at North Clifton.